“I first became aware of bonsai when I saw a display at the Pasadena Art Museum when I was a kid taking art classes there,” explains John Egert. That accidental exposure to bonsai turned into a lifelong avocation and he shares his knowledge every month for ABC members. 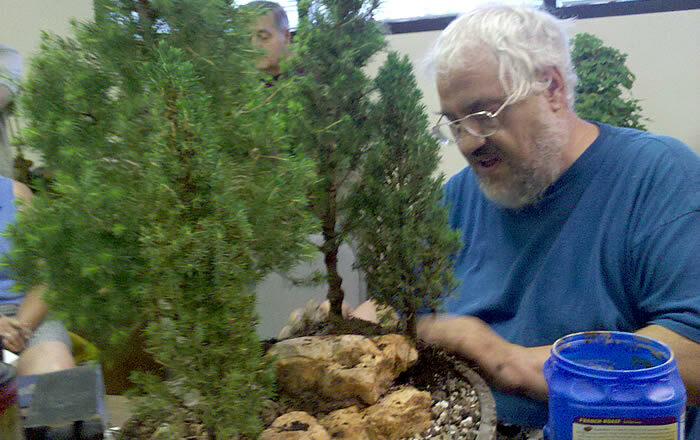 On the third Saturday of most months, John gathers a group of bonsai enthusiasts at a local venue and works through a example (or two or three). The location varies, so club members eagerly await the monthly announcement of the topic and the place. John began by teaching himself about the trees and visiting the California Bonsai Society’s shows at the California Museum of Science and Industry. “I tried different plants, but couldn’t get the look I wanted until I began making artificial trees from clay, wire, and some woodcarvings.” He continued to work with the trees while in high school and college. It was also at this time, 1972, John began to take classes from Komai. “I was living the bonsai apprentice life, and I loved it,” John exclaims. 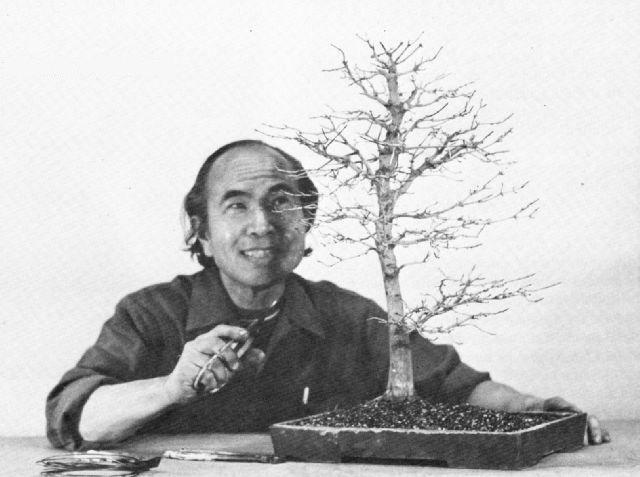 Not only was he learning from Komai, but he was exposed to all the teachers who used Khan’s classroom, like Jim Barrett, Melba Tucker, Masakuni Kawasumi, Tom Yamamoto, Yuji Yoshimura, and many others who pioneered bonsai in the United States. He also got to know Khan’s father-in-law Frank Nagata, the dean of American bonsai teachers. “We sat for hours working on trees and listening to the LA Dodgers, with whom ‘Dad” had a passionate love/hate relationship. I called him dad and he called me Johnny, which no one else ever did,” John recalls. “I also got to spend a good amount of time with John Naka, and would periodically take him a load of decomposed granite from the mountains above my house in exchange for some teaching,” John says. John became a member of Khan’s Baikoen Kenkyukia, Santa Anita Bonsai Society, the California Bonsai Society, and a charter member of Hirao’s Kofu Kai.